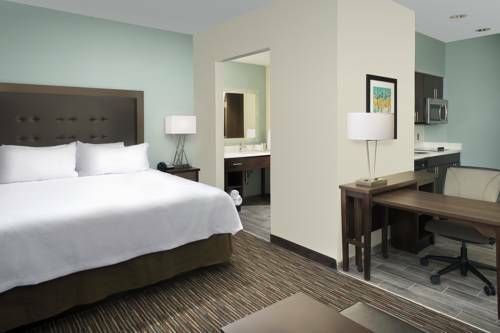 Welcome to our new Homewood Suites by Hilton San Antonio Airport hotel. Settle in and make yourself at home in our all-suite hotel just one mile from San Antonio International Airport and minutes from businesses such as KRAFT Clear Channel and Christus Santa Rosa Hospital. Explore the variety of dining and shopping options surrounding our hotel including Northstar Mall Chilis Magic Time Machine Sol Luna and more. Our San Antonio hotel also gives you easy access to the area*s most popular attractions such as Sea World and the famous Riverwalk. Wake up to free hot breakfast served daily and join us for our evening social* Monday through Thursday. Our suites provide a full kitchen complimentary internet access and HDTV. Catch up with work in our business center or host a small meeting for up to 25 in our meeting room. Take advantage of our complimentary shuttle service to and from the airport and destinations within a three mile radius. Stay in shape with a workout in our fitness center or a swim in our indoor heated pool. *Local and state laws apply.